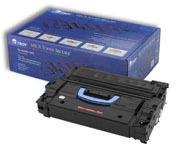 MICR Toner & MICR Ink for Blank Cheques - Print and Cheques Now Inc. Huge Savings on Business Cheques and Personal Cheques and other printing needs. WHAT IS MICR in MICR TONER? MICR Toner for blank cheque printing for businesses. Magnetic Ink Character Recognition (MICR), is the common machine language specification for the paper-based payment transfer system. It consists of magnetic ink printed characters of a special design which can be recognized by high speed magnetic recognition equipment. This series of readable characters provides the receiving party with information needed for processing the check including: check number, bank routing number, chequeing account number and in some cases the amount of the cheque. MICR characters are printed in the form of either an E-13B or CMC-7 Font. Each font series is made up of a series of numbers and symbols specifically designed for readability on cheque sorting machines which read at extremely high rates of speed. The symbols provide a beginning and ending point for each group of numbers allowing the machine to quickly determine what each series of number signifies. Line placement, character placement, skew and quality are several critical components of printing MICR; the line must be precisely positioned in the MICR Clear Band area. To create consistency in the cheque clearing process it is critical that each character is readable and that the printing methods are reliable. Another option is to order blank checks where the MICR Characters are printed at the same time you print the checks. 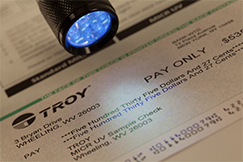 Other checks are typically printing using a laser printer on a blank check stock, in this case the MICR line is printed at the point in time when the check is created and the MICR line often contains the amount. When check printing is done in-house it is important to verify that all of the necessary elements for printing the MICR Line are in place. In order to printer your checks you will need a check writing software, which provides check formatting, blank check stock, MICR Toner, as well as a printer capable of printing MICR.